Drop Dead on Recall will be out in less the two months, and when I tell people who know me they usually ask about animals in my books. Before I get to the questions themselves, let me tell you why they come up. The first is usually whether there are animals in my mysteries. Of course there are! In fact, my "Animals in Focus" series is (pardon the expression) peopled with animals. Janet MacPhail, the accidental amateur sleuth of the series, is a professional pet and wildlife photographer and amateur dog-sport enthusiast. 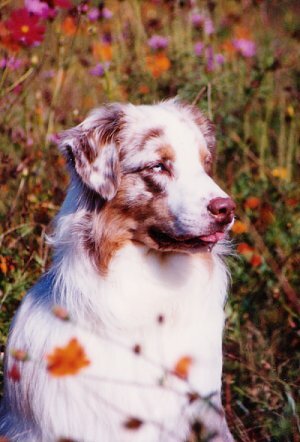 When we meet her in the first book, Drop Dead on Recall, she's at an obedience trial with Jay, her Australian Shepherd. Besides Jay, she lives with Leo, an orange tabby. Tom Saunders, the "hunk" who steps into Janet’s life when the obedience trial turns deadly, has a Labrador Retriever named Drake. 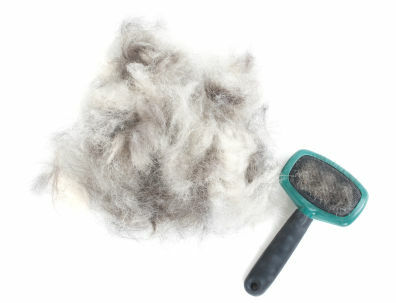 And there are several Border Collies, a Maltese, a Poodle....you get the idea. The next thing people often want to know is whether the animals are real. Of course they are. Sort of. At the micro level, the animal protagonists, Jay and Leo, are loosely based on three of my own companions and technical advisors. The real Jay went to the Rainbow Bridge in July at almost 14 years of age, but he continues to inspire me. You can read more about the real-life Jay on Jay's Page. Janet's Leo is based on my own two lovely orange tabbies, Malcolm and Leo, who are now rolling in catnip at the Rainbow Bridge. 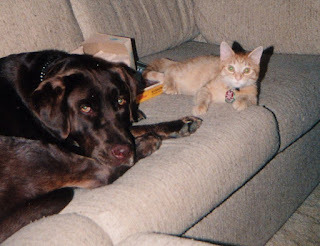 Drake is a composite of my own three Labrador Retrievers – Raja, Annie, and Lily – and the many Labs I’ve worked with in rescue and as an obedience instructor. Other dogs and cats in the stories are similarly based on dogs and cats I’ve known or heard about. scenes in Drop Dead on Recall and the sequel. The animals I write about are "real" in a broader sense, too. 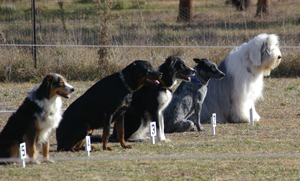 They act like animals with canine and feline motivations (as far as we can determine, anyway). Since I expect human characters in books to act like people, this seems fair. Don’t get me wrong – I’ve spend many happy hours with a cat on my lap and a dog curled around my feet as I read about crime-solving critters pointing out clues or commenting on the feeble abilities of their human sidekicks. It’s just that I have spent a lot of time with animals and have seen the problems caused when pet owners regard their pets as deficient people rather than excellent critters. My experience informs my fiction. How can it not? So the animals in this series are as realistic as I can make them. And here’s the thing.... Real animals are fascinating just as they are. Their motivations are complex and individual. They can be by turns altruistic and self-serving and sad and playful and indifferent and loving. Like any strong character in fiction (and life), they are multidimensional. I could go on and on about this, but I there's a furry chin on my knee so I’ll leave this line of thought for Janet MacPhail to pursue. She's a woman of strong opinions when it comes to animals. For now, it's time for a walk. 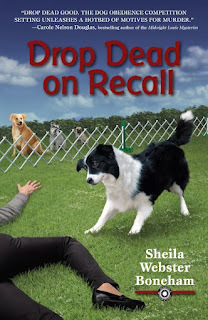 Sheila is planning a special "virtual book launch" in October to benefit canine health - watch for updates, or "Like" Sheila's Facebook Page for information. Pets are very popular in mystery fiction. Many people enjoy them as characters whether they have pets themselves or not. Of course, dogs make excellent therapy helpers as well as cadaver hunters. Oh, we're suckers for animals in mysteries. I put a cat in as a clue in "Fools Rush In" and then decided to keep him around for the rest of the series. His name is Shamus. I've got my first fluffy orange cat, much like Malcom. I call him Rusty. Not the brightest in the bunch, but very loveable.